What Does Code P0008 Mean? The complex ballet of mechanical and electrical parts in your engine make it possible to harness the power locked away in every drop of fuel injected into the cylinders. As is the case with many things in life, timing is absolutely critical. If the cylinder isn’t in the right place at the right time, you’re not going anywhere, or at least not smoothly and quietly. 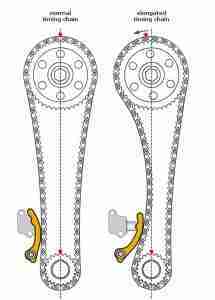 Mechanically-speaking, the timing in relationship to the crankshaft and camshafts must be precise, which is the function of the timing sprockets and timing belt or timing chains. Depending on the engine, the crankshaft may be connected to the camshaft(s) by a belt or chain and dual-overhead camshafts may be connected by gears or chains. Timing precision is absolutely necessary, not only for good engine performance, fuel economy, and emissions-reduction, but also to prevent damage to the engine itself. As the crankshaft pushes cylinder 1 up to top-dead-center (TDC) on the compression stroke, the valves for cylinder 1 should be closing, and the spark plug should be firing, for example. If timing is off by a few degrees, the results could range from poor performance and fuel economy to catastrophic engine failure. Regarding timing, to keep the engine running properly, the engine control module (ECM) continually monitors the crankshaft position sensor (CKP) and camshaft position sensors (CMP). If the ECM detects that CKP is ahead or behind Bank 1 CMP, either a four-cylinder engine or the V6 or V8 bank with Cylinder 1, perhaps due to a jumped timing belt tooth or a stretched timing chain, it will illuminate the malfunction indicator lamp (MIL) and set DTC P0008, “Engine Position System Performance (Bank1),” in system memory. What are the common causes of code P0008 ? The main cause of DTC P0008 is stretched timing chains. 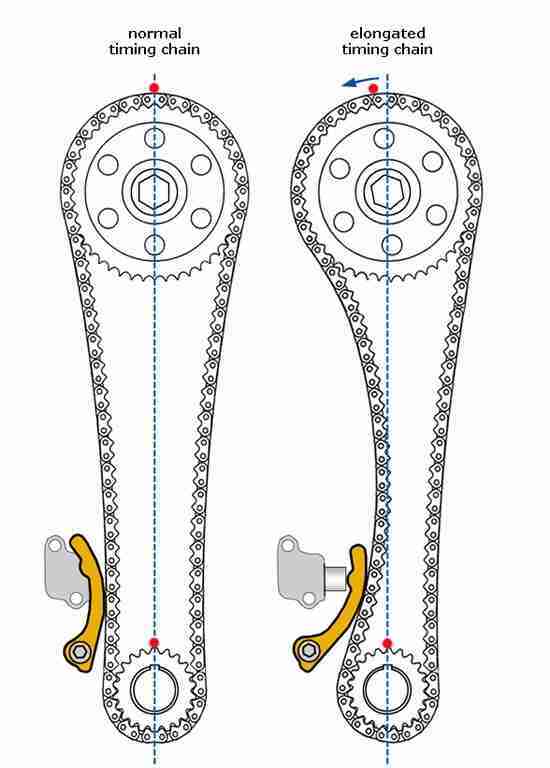 While this doesn’t eliminate timing belt stretch as a problem, it seems that the tolerances are much looser, on timing-belt-equipped engines, than on timing-chain-equipped engines. General Motors – It seems that a great many of the P0008 cases reported involve much of the lineup of GM vehicles. For most, the fix has been to replace the timing chains, including the tensioner and sliders in some cases, and to recalibrate the ECM. The ECM recalibration seems to be along the lines of loosening tolerances for the alignment. It has been suggested that infrequent oil changes, not using the recommended oil, or using bargain oil filters may accelerate chain stretch. We recommend, no matter what vehicle you drive, stick to the manufacturer recommendations regarding engine oil change intervals and specifications. Jumped Tooth – While this isn’t very common with timing chains, the flexibility of timing belts makes them slightly more susceptible to jumping teeth. What are the symptoms of code P0008 ? Aside from the MIL, you may or may not notice any drivability problems. Symptoms may range from poor fuel economy to rough idle and poor engine performance. 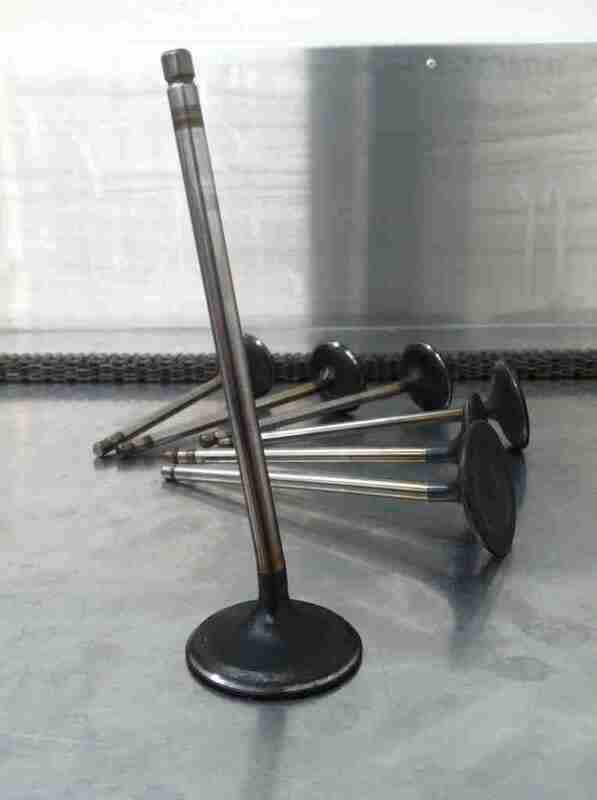 You may notice excessive noise from the front of the engine, under the timing covers. How do you troubleshoot code P0008 ? It does one good to note that this typically not a sensor problem, since the ECM can only use good sensor readings to determine whether or not the engine is in time. In other words, if a CMP is bad, it cannot check for good timing between that CMP and the CKP. That having been said, diagnosing timing problems may best be left to the professionals, particularly if your vehicle is still covered under warranty. Always double check warranty application before opening up something as critical as the timing covers. With an up-to-date repair manual, experienced DIYers may be able to diagnose this problem, though the availability of special tools may limit repair ability. Depending on the model, at least the top timing cover or the valve cover(s) will have to be removed in order to see the timing marks. 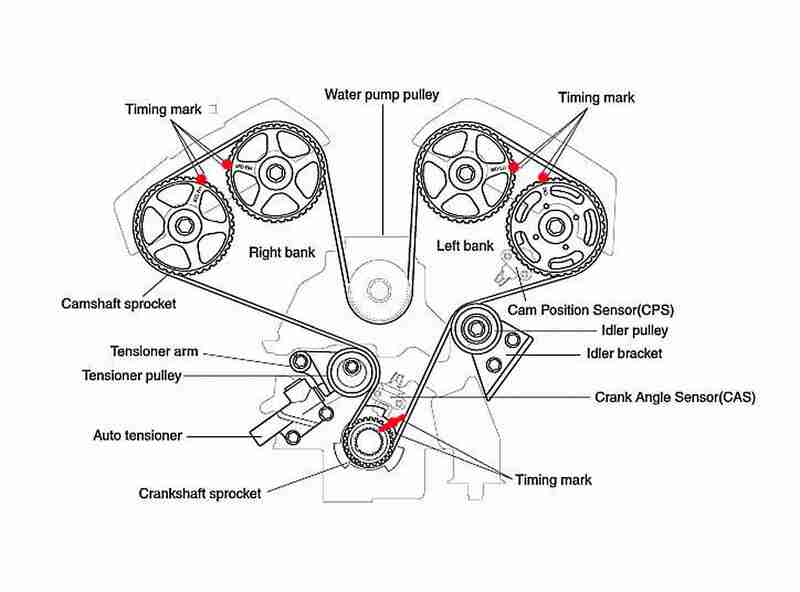 Rotate the crankshaft pulley clockwise until it’s timing mark is at 0° or TDC. If you cannot see the camshaft timing marks at all, then you’ll need to rotate the crankshaft another 360°. 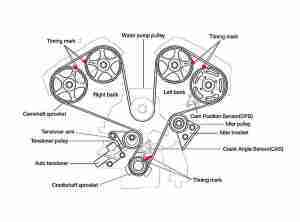 Once the crankshaft is rotated to TDC and you have the camshaft timing marks in view, you can verify their positions. If the camshafts are aligned properly, suspect a crankshaft or camshaft reluctor ring problem, which could be skewing CKP or CMP readings. Further disassembly will be required to verify that reluctor rings are properly aligned to their respective shafts. If the camshafts are not aligned properly, suspect a skipped or stretched timing belt or timing chain. Loose or worn timing belt or timing chain tensioners can also cause a misalignment problem. Further disassembly will be required to verify proper belt or chain position, tensioner function, and measure the timing belt or timing chain. In case the timing belt or timing chain has skipped a tooth, it will need to be reinstalled properly. In case of stretched timing belt or timing chain, it will need to be replaced. In case of a worn tensioner, it will need to be replaced. I am having the same problem with my 2008 Cadillac SRX V6. The timing chain was replaced twice while under warranty. Not sure if I will replace or just look for another vehicle….. I am not finding any information for such a code. Other than “B” for body. My voltage light comes on also at times in a 2008 Dodge Avenger 4 cyl. Am I able to get any more info. from this diagnostic system?